This thread contains comments for the article "Battery Powered Sensors" posted on MySensors.org. Here is a view of a node running exactly 1year. The effect of a bad radio is seen here as the fast voltage drops. I had a very low charged battery to start with, replaced it with new batteries which also discharged fast, and replaced both batteries and the radio. Since mid january 2016 the node has been running as expected. My guess is that this combo will run for 2 years (given how it has been working the past 9 months). This node measures battery voltage, temperature and humidity and sends 3 messages about every 5 minutes. And here is the battery measurement of the second node that went "online" the same day (18/sep/2015, with a good radio, and similarly used batteries from the start). This node sends very few messages (at least 1 every 24 hours, and when one of 3 contacts are opened). Most days it just sends 1 message. Sorry, where do you measure the power when it is in sleep mode? ie, where do you put your multimeter probes. You need a very sensitive multimeter though. Most multimeters won't be able to measure low current reliably. @mfalkvidd that's what I thought! I see that I'm getting 3.4V in the multimeter but my pro mini nor nano will start up (I have not removed the LEDs so they should light up). If I use more V (6.8V) I put in via RAW on the PRO mini, and I can see teh voltage, but the same thing, it's not starting up, hmmm I wonder what rookie mistake I'm doing! @Nicklas-Starkel sounds like you have the multimeter set to measure voltage instead of current. Which multimeter model are you using? Could you post a photo? There is usually a dial that can be turned to switch mode. Many multimeters also require moving one of the probes to a different connector (on the multimeter itself). @mfalkvidd , it was too late at night for me. I had it at current but it didn't show anything. So without thinking I put it at voltage. And the problem with not showing anything when I had it at current was I had blown the internal multimeter fuse some days ago. Hi, I built this circuit and arduino reads 1.11 V or 33%. I've new batteries and multimeter reads 3.10 volts. Do you know what could be wrong? I'm using 1M and 470k resistors on pin A0. Did you put this command in the setup sketch ? It's normal to have 1.1V on A0 when you have 3.3V on your batteries. Where did you get the 1.11V value ? In the serial print or with your multimeter ? If you read the value with the serial print, which variable is it (sensorValue or batteryV) ? Can you post the logs of your node and the skech used ? @bjacobt hmm. Yes, you are correct. The calculation seem a bit strange. Looks like the calculations in the sketch are wrong? Or at least confusing I'm pretty lost. must give you 1023 and not 330. For me it's a problem of value resistance or analogReference. Ok it's not a problem with the analogReference, you can delete this part of code. Did you control your resistance value and did you do this schema ? I'm sorry what do you mean by "control your resistance value"
1M resistor to +V rail, 470K resistor to GND and middle point to A0. can Li 18650 3.7 batteries be used as they are rechargeable ? knowing the max voltage at full might reach 4.1-4.2v ? maybe keeping the voltage regulator ? @Meshx86 yes they can be used but as you've already identified the nrf (and maybe other components) will need to be protected from the high voltage when the battery is full. The self-discharge rate of li-ion is higher than alkaline batteries which might affect how long the node can run before it needs charging. So far so good, I can read the voltage of the battery etc but my problem is, it consumes about 1.2 mA while in sleep, this is about factor 10 of the findings from the thread. Any glue what could be wrong or what get others with that setup? The Arduino is not modified at all. @parachutesj you have to modify the pro mini. Remove the power led according to instructions! I read the description again and thought that it should be 120uA stock and when removing LED and regulator it will even go down further but thinking about it, how should at base 120 uA and removing LED save additional 1.5mA???? LOL, sorry was a long day. My Fluke reads 0.044 mA in sleep now (without LED). Sweet! Another battery related question that I really do not understand. Are there different versions on how to read battery consumption? Is it due to different libraries or maybe it is the same but just programming wise different? If you are using the first sketch you dont have to use a seperate pin to measure the input voltage. There are also no resistors. You can run this on a bare ATmega with minimal hardware. One would think running with no resistors and not using a separate PIN would be better. @hek or @mfalkvidd , any comments as to why the original sketch is preferred over the other 'way' in this article? Since it was so outdated (2 years) I naturally assumed the 'battery powering article' was a newer way to do it (especially since mys2.0). Also, the post you linked to is attributed if you use no voltage regulator. And in the article this is also one of the things you are recommended to remove, hence making it even more confusing as to why the article describes another way than the post. 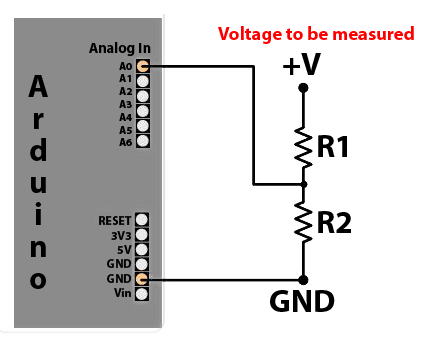 1- using the voltage divider is needed if there is a voltage regulator / booster where where VBatt != Vcc. 2- using the voltage regulator is not needed if the voltage regulator is removed / no booster is used (powering directly from 2 x AA batteries) where VBatt == Vcc. *I've noticed the 2nd method requires inputting battrie's DMM measured values vs arduino ones for correction, is this a down side if you need to change the battery later on ? or is it just programmed once ? and does the 1st method rquirs these corrections too ? actually, you need a voltage divider if the voltage to be measured is above the maximum allowed by the processor at the speed you are running it. If Vcc is 5V, then any voltage above 5V should be measured via a voltage divider. If Vcc is 3.3V same principle, but you could get away with measuring 5V directly (would not kill the processor), but your values may be off. @GertSanders following the instructions of this post suggest using Alkaline batteries (apparently Li-ion aren't a good idea for sensor nodes ?! plus they are expensive), the optimal solution would be using 2 x AA batteries as some ans this post suggested. I believe there is no way 2 x AA batteries in series would measure anywhere near 3.3v, the max i measured with brand new batteries was 3.2v. would i still need to the do the voltage corrections when using the voltage divider ? if so, does that need to be reprogrammed every time you replace the battery ? No problem to ask. I use the intern measurement method, which uses the internal 1.1V reference of the atmega328, so even if the Vcc value changes from 3.2V -> 2.6V, the reference will always be 1.1V, and the internal method allows you to calculate the actual measured battery voltage based on a difference with the reference, even with a declining value on Vcc (if powered by the same batteries). @GertSanders sorry mate, am more of a software guy..
is this necessary for an accurate reading ? and is the corrective value need to be just entered once (like a calibration per arduino) or need to be reconfigured every time you replace a battery ? The corrective value is needed every time you change a battery, AND if you need high accuracy. On my battery based nodes I do not have a need for absolute accuracy, I just need to see the trend of the Vcc value. Changing the battery happens every 12-24 months (depends on the use), so I'm not very interested in absolute accuracy. If you need real accurate measuring, I would suggest a real Analog-To_Digital chip. @GertSanders thanks , i think accuracy isn't a deal breaker, i believe everyone's concern is to just know when the batteries need to be replaced (hopefully that can be done without specifying the voltage correction). The correction factor is optional. You can use it to improve the measured voltage, as the internal voltage reference is only accurate up to so many percentage (have to look up the number). It is unique to the arduino used. if max battery voltage is actually 3.2v, does that mean that the battery percentage would show 100% for quite sometime before it starts dropping below 3.0v (assuming vmax is set to 3.0) ? or would it increase the inaccuracy gap ? @Meshx86 the function Read_Perc() takes a boolean as 3rd parameter. Default it's true, which means the result is clipped to 0..100% range. So, if maximum is set to 3v, and you are currently above it, it will report 100% until you drop below 3v. @Nicklas-Starkel The article mostly talks about rechargeable batteries. I prefer non rechargeable Lithium batteries (like coin cells) for their energy density and very low self discharge. "Primary cells such as lithium-metal and alkaline retain the stored energy best, and can be kept in storage for several years." So you are correct and between Alkaline and Lithium-metal maybe the latter would be best. I have no experience with coin cells and will do some testing with them as soon as I can. Since this is the battery article, would you please tell me what you use and how you use it. What you expected and if the batteries lived up to your expectations. Would be cool to know as you've had more experience then me (and many like me)! @AWI I'm agree with you but coin cells have less capacity. The difference of the self discharge between coin cells and alkaline is not important (1% vs 2%), but the capacity and size are. @Nicklas-Starkel I mostly use a 'large' version lithium cell i.e. Cr123. These were used large in compact camera's and have a huge capacity and very little self discharge. My best example is the sensor in the fridge which measure temp and humidity every 10 secs and sends with nrf24l01 (MySensors of course). This one runs for almost two years now and has a stable 3.02V since the second month. The coin cells need special care a these have a high 'internal resistance'. You need to be careful with designing the sketch so that the load is as short and light as possible. @AWI OMG there is so many options when you look at it! I think it all boils down to design (size) or money. Coin cell roughly 1EUR/pc and they are the smallest but not packing a good punch while being semi cheap/expensive. And to top it off, I know there is a company in USA that has created a new battery that will double 'Ah' in same size batteries. They should launch this month i think, but think they will go for cellphone makers in the beginning. So "myPerc" returns a value of 98% which seems feasible, also when reducing Voltage it drops. It seems you are missing the capacitors connecting each side of the crystal to ground. Those should be between 15 and 25pf (depends on the crystal), normally ceramic type. How are you sending the voltage? Sensor = S_MULTIMETER and value = V_VOLTAGE in a normal message? Thanks! I'll use that approach for all my house sensors, since right now all I send is battery percentage..
...at least until/if they add support for a I_Battery_Voltage internal value. Realy n00b in electronics here but do you need to use those exact values of the resistors when hooking this up? If so, they can be any size but the code will need to be adjusted if the ratio between the resistors is changed. Also, less resistance will drain the battery faster. This is like going back to school... but fun! can someone explains why using analogReference(INTERNAL) ? for the moment i only have 5V nano suplyed by a 7.4V lipo (i know, this is not a good choice, but i just have this right now) so with that hardware, 1.1V seems too low. I mean that resistance ratio to reach 1.1V max smells a very inacurate result; isn't it? for obtain this value i did : R2 = R1 / ( Vbatmax - Vref); R2 = 1.1^6 / (7.5 - 1.1) = 172k, i taked a normalized value = 180k. Let me know if i'm wrong somewhere. If I power my 3.3V miniPro through VCC, do I still need to remove/cut the voltage regulator? I thought the current moved from vvc-in/raw through the regulator and then to the MCU and VCC . My battery powered nodes are dying and I suspect I need to change BOD and eventually something more (LED gone )..
VCC pin is directly connected to the MCU. The RAW or IN pin is connected to the regulator input. Th eregulator output is connected to VCC pin and thus to the MCU power input pin. On a 3V3 promini you can give between 3V3 and 12V (on most promini's, some can handle up to 16V) on the RAW or IN pin. The regulator on the promini will bring that down to 3V3 (which you will be able to measure on the VCC pin). By giving 3V3 on the VCC pin, some power is lost via the output pin of the regulator (through the regulator) towards the GND pin of the regulator. This should be minimal, but on bad regulators it can be enough to drain a battery in weeks. So yes, I would cut the regulator output line when giving power via VCC. Cutting the line of the powerLED (on either side of it, doesn't matter) will make sure that the LED does not drain the battery either. This LED can pull between 5 -15mA depending on the protection resistor that sits in series with it. So VCC pin and RAW pin are NOT the same. @GertSanders Thanks for you explanation. I thought vvc on the short end next to rx was going through the voltage regulator just as RAW. Anyhow I have already de-soldered the LED's and are powering through vcc next to A3. Apparently my voltage regulators are bad so I'll cut the lines and give it a try and hope power consumption stays low. I've used the Vcc library to read the battery level without voltage divider or any other external components. Is this not a reliable way to measure? @maghac The Vcc library is reliable. It uses the internal 1.1 v reference of the MCU to measure the voltage on the Vcc pin. If your sensor keeps reporting 100% I guess you either power the arduino through a regulator (or the raw pin) or missed something in the Vcc initialisation/ calibration. @AWI It's possible that I missed something in the code. I am powering the arduino directly on VCC though and I'm not using a regulator. Do you think that the use of a piezo electric switch is possible ? @aclertant Interesting idea... Energy harvesting with piezo-electric components is certainly possible. From MySensors point of view the energy (very very little) has to be stored and boosted to power the radio and mcu for message processing. There are a few examples of "harvesting" remotes (i.e. Philips HUE) but I am not sure if these use a piezo element. I removed the both the LED and the Voltage Regulator of an Arduino pro min 3.3v . The simple sketch on it's own works fine. However when I connect an NRF24L01 it does not communicate back to the gateway.. If you look at enocean products there are already commercial energy harversting switches in case you don't find a way to make it. we need something like this but for NRF24L01 module. Do you think that possibly exist or there is a huge problem ? Like no eeprom or something like that ? You see, enocean protocol has been developed from the start to be used with devices that use energy harvesting, so you can't think to use general purpose HW (like esp8266, FRF24, Arduino boards) that is not optimized very low power consumption (look at all the mods required to make a mini pro last months on battery with a reed switch and a nrf24 module); with piezo-electric components the amount of energy is really really tiny so you need super optimized HW to work with that. The link you posted is about something that works on a ESP8266 but that works over wifi, that is for sure not the best energy efficient system. It doesn't need any external resistor, so there will be no current flowing even when the Atmega is asleep. @napo7 This has been mentioned in this topic. @Yveaux Vcc library is the easiest way to handle this. @AWI Ahh Sorry ! Didn't seen the comment ! I'll have a look at Yveaux's lib. I have used resistor ( 470K+1M ) to measure the voltage on a 5 minute interval. The Soil sensor is out in the garden where the container housing the arduino pro min gets exposed to sun. The voltage reading is high during 1 PM to 4 PM, when its under the sun. I am not sure if this is because of the heat. The code is given below. Please note I multiply my actual voltage with calibration variable. however during the high voltage time the calibration variable does not seem to work. Battery powers the soil sensor. The voltage regulator has been removed. MCU powered using vcc pin. Using voltage divider still might be necessary if you don't have battery directly connected to the MCU VCC, for example using step-up/down regulator to power the MCU. In this case you still can use a voltage divider and have a P+N Mosfet to control the current going through the voltage divider, so no leak to ground. In practical terms you basically use another GPIO to enable or disable it the Mosfet when needed. I saw that on the Whisper Node board I'm using and seems to be effective (reference: https://bitbucket.org/talk2/whisper-node-avr#markdown-header-voltage-monitor)... In any case using high value resistors (over 100K) will reduce any current draw. Finally a small capacitor can be used to stabilize the voltage. All is working fine when on usb cable.. but it fails when connected to 2x 1.5 AA batteries.. I did a test with a variable power supply , and I can confirm that the pro mini does weird stuff at smaller then 3v, but it works at 3.3v.. I have now also ordered those 3.3v up-boosters (because I already bought the battery mounts) mentioned here. What would be the best approach if I wanted a battery powered node using a 5V sensor? I want to build a secret knock sensor but I want it to be battery powered. I was thinking about using 3xAA batteries (3x1.6 would be 4.8V max) and a 5V step-up converter and then power the sensor and the arduino (on the raw pin, since it's a 3.3V arduino). The radio would be powered from the VCC on the arduino. I think that isn't going to be a very efficient way. Are you sure there isn't any 3.3V sensor you could use? Change the BOD on the arduino to something lower than the 2.8V default. Power everything from the batteries except the sensor. Use the 5V step-up converter only for the sensor. @ileneken3 Good idea, i think I'll design it that way. I also had a closer look on eBay and found another sensor that runs on 3.3v. "Disconnect or desolder the 3.3 VDC regulator because it is not needed." => Why it isn't needed? I assume it is needed when connecting a sensor that requires 3.3V (e.g. HTU21d or even the RFM69)? I assume the assumption made here is that you're using 2 AA 1.5V batteries? I'm using 3 LR44 (3x1.55V) so I suppose I still need the regulator. @mpp the line below the one you are quoting says "Power the device with two AA batteries connected in series". So yes, your assumption that 2 AA batteries is used is correct. Hi, i've got a barebones arduino circuit set up with a dht22 sensor. It's powered off 2 aa batteries. All works well with the two batteries even when they are running at about 3.0 volts combined (it would probably run at lower voltages but batteries haven't gone down that far yet). If i power directly from usb with my ftdi interface all works. However, when i add the 3.3v step up, the radio doesn't get a response from the nrf gateway anymore. I have a 4.7u capacitor on the nrf. The gateway is receiving some data but not all as i can see "mygateway1-out/0/255/0/0/18 2.1.1" in my mqtt broker every couple of seconds but the mysensors client never seems to get fully initialised. I've tried two or three of the step ups and checked the voltage with a multimeter and i'm getting circa 3.3v. One thing i did notice is that when i swapped in one of my 3 dht22's it worked initially but then stopped, the other two wouldn't (all work without the step up). I think this is a bit of a red herring but putting in here for information. Any thoughts? share your schematic. from what you are describing it seems like the step up converter is not able to provide enough current. but the dht22 would not work, it requires at least 3.3v (however i succesuffly used it with 3V). I think that NRF has some decoupling capacitors onboard, so unless the boost converter design is not totaly wrong it shouldn't be a problem. schematic would be helpful. Here is my breadboard design, i'm afraid the schematic in fritzing isn't really in a state to post here. It's unreadable. The resistors shown in the diagram wouldn't have the correct values i used. The values i used are from the arduino site for creating an arduino. The ones shown are used for the sake of creating a pcb. The DHT22 goes on the 4 pin header, the NRF goes on the 8 pin header.